How do I update the URL of a form? There are several reasons you may wish to change the URL of your form. Maybe you are restricting access to a more limited pool of applicants and want to make sure the original pool can no longer access the URL. Maybe you are updating the form for a new cycle. 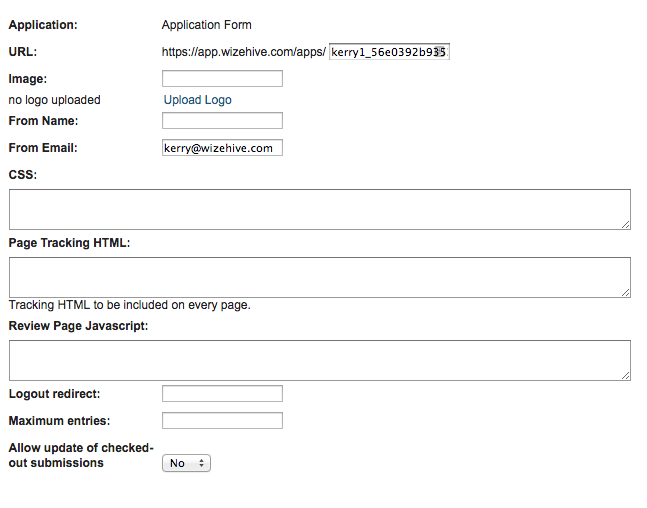 Or maybe you would like the form to close but still have the ability to share a URL with select applicants if needed. Please note, however, if you opt to change the URL, the former link will not redirect. This could have unintended consequences if you have applicants you'd like to continue accessing the application. Make sure the URL change is communicated to the appropriate parties. In order to update the URL, go into the Data tab of your workspace, which should initially look like this. Then click the Form Settings button in the top right. In the top portion of Form Settings (the third field down), you will seen URL. The first part of the URL cannot be changed; however, you can change the last part, after apps/, called the form slug. You can simply clear out what was there before and enter the new URL. Click Save App at the bottom of the Form Settings. You should now begin accessing the form with the new URL you just created. If you are using an Advanced Cart, an additional step will need to be taken. From the Form Settings, click Advanced Settings to see this screen. In the top part of the first Advanced Settings tab, you will see another field for URL. Make sure that your desired updated URL matches up with this one as well, and update accordingly. Click Next at the bottom of the Advanced Settings screen until you hit the last tab in order to save your changes.